Settle in for coffee, stay for a little TV binge, and take it wherever you end up next. Breakfast in bed is a nice start. But if you're feeling snug, why not let that loving feeling linger? 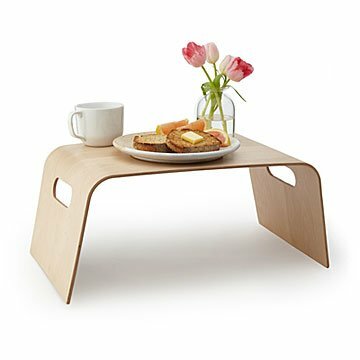 This sleek Scandinavian-inspired tray (they invented hygge after all) invites you to settle in for a cardamom bun, stay for a little TV binge, and, when you're ready to come out from under the covers, take it wherever you end up next (the kitchen for another bun, we're guessing). Made from birch veneer covering a willow wood core in China. L: 21.25" W: 12.25" H: 8.75"